In support of London Rivers Week, Thames Estuary Partnership are offering a FREE guided walk along part of the Thames Path. 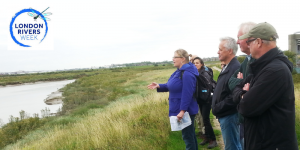 Starting at Erith Station, this fascinating walk will take you 4 miles along the Thames whilst listening to talks on environmental issues such as recycling, nature, water, recreation, the sea, the Barrier and water defences concluding at Slade Green Station. You could even spot a seal along the way!